Newport Flood Warning – Are You Prepared For Winter Storm Damon? Forecast calls for a whole lot of nastiness. For those of you who have been hating the recent sub-freezing temperatures, we have a good-news/bad-news scenario. The high Tuesday is forecasted to be 53°F, which would be pretty nice for December…if it wasn’t accompanied with a 100% chance of precipitation. 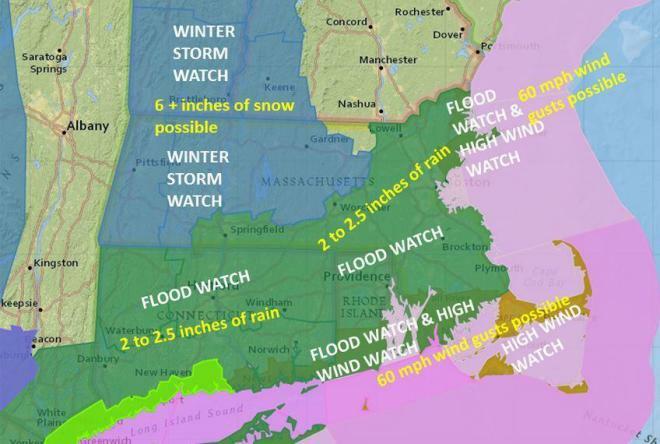 The National Weather Service issued this map, where southern Rhode Island gets the 2-for-1 combo of a flood watch along with a high wind watch for those 60 mph gusts that will be doing a number on all those Christmas ornaments you just put up outside your house. * THE HEAVIEST RAIN LOOKS TO COINCIDE WITH AT LEAST PART OF THE TUESDAY EVENING RUSH HOUR. THIS WILL LIKELY MAKE FOR A VERY DIFFICULT COMMUTE… SO MOTORISTS SHOULD PLAN ACCORDINGLY. So for those of you who haven’t built your arks, make sure those sump pumps are ready to go.